While pignoli (pine nuts) are the classic nut to use in pesto, another ‘native’ nut has become increasingly popular, the pistachio. Typical nuts that can be found there are pine nuts, pistachio, almonds, walnuts and hazel nuts. Pesto can be made with all these nuts, of course but different nuts shine for different purposes. 1/2 cup (2-3 oz) grated Pecorino Romano and/or Parmesan cheese. 1. 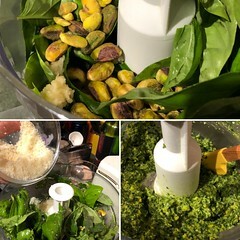 Put the garlic, basil, parsley, pistachio, lemon juice, salt and pepper into the food processor. 1. Add one ladle of pasta water when mixing with the pasta, .